Counterstrike Global Offensive has a weapon skin system that allows players to pay for the chance to get rare weapon skins. Because of the way the weapon skins are generated, sometimes the odds for getting the rarest skins are very, very small. Each weapon skin also has a physical wear condition - getting factory new versions of a skin, for example, is far harder than getting a scratched up version. This can increase the rarity of skins even further. In this blog, we take a look at five of the rarest CS:GO items ever to be unboxed and provide an insight into how much they can be sold for. Let's start with one you may have heard about. The Dragon Lore is the rarest CS:GO AWP skin in existence. It's also one of the most desired skins because it looks so incredible. This skin looks like it's been made out of pure gold and a red dragon has been inscribed on the sides. This skin is so rare and widely desired that many players haven't even seen it in-game in another player's inventory. Just getting to hold this weapon is an experience in itself. The standard Dragon Lore is spectacularly rare, but that's only just the start. Getting a factory new version without any scratches is very difficult. You would have to pay about $2,200 to own a factory new version. But wait, it doesn't stop there. There are even rarer " Souvenir " versions of the Dragon Lore. These can only be opened from boxes that drop during a CS:GO Major championship on the cobblestone map. Even the box itself is rare and goes for $20-$40 - usually CS:GO weapon crates go for as little as $0.04. The chance that a factory new Souvenir AWP: Dragon Lore drops from a Cobblestone case is incredibly small. Usually, these sell for $35,000 each. Sounds crazy right? It gets crazier. Souvenir Dragon Lore skins will also have stickers randomly applied to them. Stickers will include the autograph of pro player that played during the match that the box dropped. 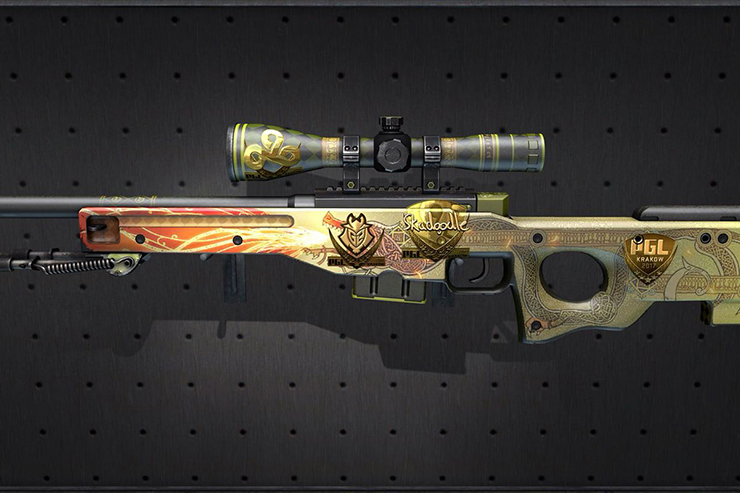 The most expensive Dragon Lore skin sold for $61,000 - it dropped during the CS:GO ELEAGUE Major Championship Grand Final. The price was so high because it included Skadoodle's autograph sticker. Skadoodle is Cloud9's main AWP player, and he also got the round winning kill to secure Cloud9 the Grand Final victory, so a collector paid a huge amount for it. It sounds strange that a tiny virtual sticker could be worth so much, but in the case of the IBUYPOWER Holo Sticker, you'll be looking at paying around $7,5000. 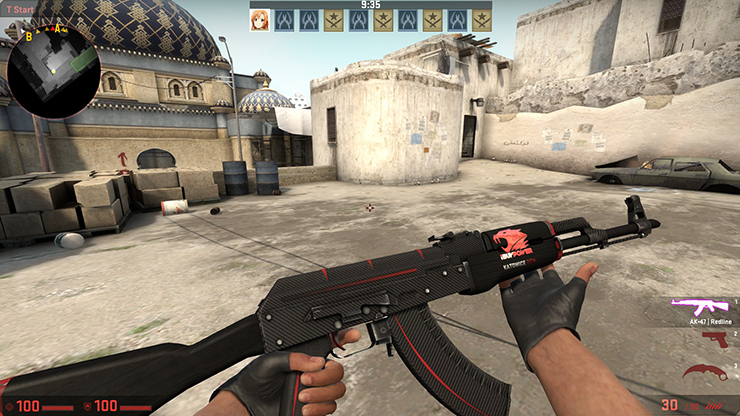 This particular sticker can only be opened from sticker capsules that dropped during the Katowice 2014 tournament. This sticker is worth so much for a number of reasons. Firstly, the sticker capsule supply is very limited, and once they're opened, they're gone forever. The capsule that can drop this sticker now sells for $750. Secondly, the drop rate for this particular sticker is very small. Finally, the IBUYPOWER team were involved in a huge match fixing scandal that resulted in the entire team being banned from playing CS:GO competitively. Owning this sticker is like owning a piece of history. This is the combination of two different items. Firstly, you have the Titan Holo Sticker from Katowice 2014. Whilst this team wasn't involved in a match fixing scandal like IBUYPOWER was, the organization disbanded, so this is the only chance for players to get this particular team sticker. Each sticker sells for roughly $4,000. 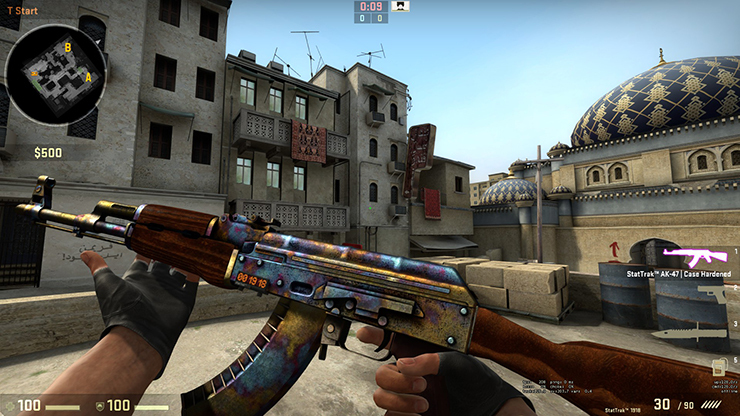 We also have the Factory New StatTrak AK-47 Case Hardened - this particular CS:GO weapon skin is very interesting because the pattern is randomly generated each time. In most cases, the skin will end up looking something like what is shown above. This particular skin will sell for about $200. However, in very rare cases, the StatTrak AK-47 Case Hardened will be completely blue. The price of this skin can vary, but it is rumored to cost roughly $20,000-$30,000. 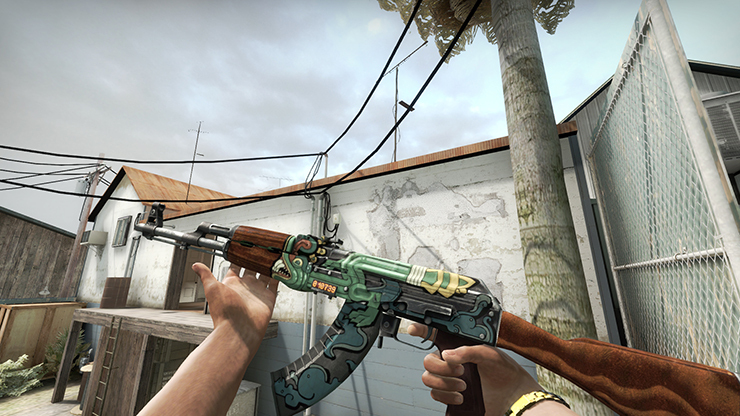 When you add the four stickers on, this particular weapon could now sell for up to $46,000. When the M4A4 Howl was first released, it wasn't really that rare - it was just the standard ultra rare item for the crate that it was a part of. This meant that a Factory New StatTrak version would have probably sold for around $400 at the time. The M4A4 Howl, however, had to be removed from the box completely. The item was taken out because the artist that made the weapon essentially used copyrighted artwork. The gun was redesigned and removed from the box, but that didn't stop the existing M4A4 Howls that had already been opened from circulating through the market. 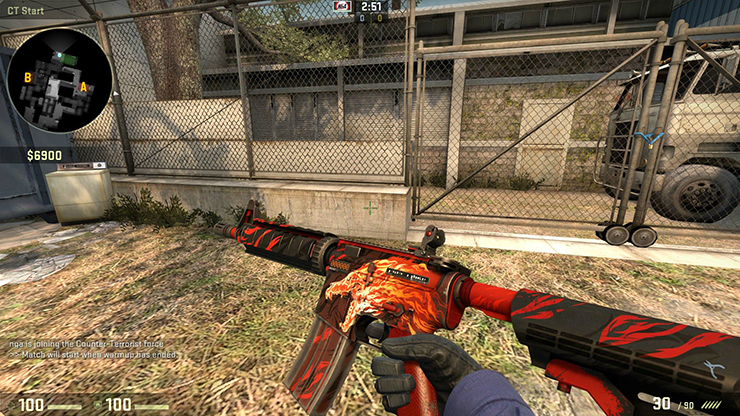 The M4A4 Howl stands to be the only weapon that can no longer be unboxed in CS:GO, which means the supply is limited. As a result, this weapon currently sells for between $3,500 and $4,000. The final item on this list is the Factory New StatTrak AK-47 Fire Serpent. There wasn't anything particularly special about the origins of this skin, but it simply just had one of the lowest drop rates out of all similar skins in its class. Eventually, Valve added the ability to turn lower tier StatTrak weapons into higher tier versions through trade up system, so the price of the StatTrak Fire Serpent dropped. With that being said, this particular version of the Fire Serpent still sells for $3,000. The craziest thing is a good 20-30 of these items are sold each month. What are your thoughts on these rare CS:GO items? Do you think it is crazy that people are spending so much money on these things, or can you understand the hype?